Dudu-Osun Fragrance Free African Black Soap is crafted entirely from natural ingredients and herbs handpicked in Africa. This soap will have you feeling refreshed and silky smooth. Containing citrus juices and native honey with aloe vera, this soap will help restore damaged, dry skin. Dudu-Osun is a traditional African solution to help refresh skin and keep it healthy. 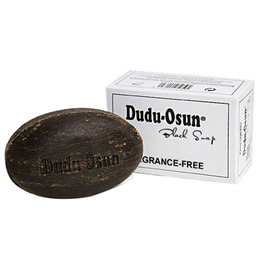 Dudu-Osun cleanses, nourishes, protects and invigorates. Palm Kernel Oil, Ashes of Burned Cocoa Bean Pods, Water, Natural Glycerine, Shea Butter, Honey, Lemon Juice, Lime Juice, African Sandalwood (Camwood), Whole Leaf Extract of Aloe Vera. Just add a small amount of water to the Dudu Osun African Black soap and it will lather naturally. A little goes a long way. Below are reviews of Dudu-Osun Fragrance Free Black Soap - 150g by bodykind customers. If you have tried this product we'd love to hear what you think so please leave a review.